Robert Koch utilized animal model systems to put forward his postulates while discovering the etiological agents of anthrax and tuberculosis, Bacillus anthracis and Mycobacterium tuberculosis, respectively. After more than 130 years, we have achieved limited success towards understanding these two pestilences, which have propagated as scourge against humans. B. anthracis and M. tuberculosis are diverse organisms, which share a common evolutionary path in tropics. They adapt unique strategies to overcome unfavorable conditions and surpass the host defense mechanisms. B. anthracis is an endospore forming bacteria that primarily acts by releasing toxins in the host cells.. M. tuberculosis is an intracellular bacteria that resides within the host macrophages by blocking phagosome-lysosome fusion events and ensuring its own survival. The bacterium can remain dormant for long periods, and when activated, it spreads in lungs and other extrapulmonary sites leading to formation of necrotic granulomas. The two diseases are immunologically distinct examples of inducing primarily either humoral or cell mediated immunity. Natural immune response to the two diseases probably explains early success achieved with the anthrax vaccine, while the hunt for successful tuberculosis prevention is still on. For comprehensive understanding of these diseases, model systems are of utmost importance that can alleviate detailed assessment of disease etiology and introductory treatment regimes. In this review, we discuss the various in vitro and in vivo model systems used to study these two diseases, discussing their contributions and recent themes. Keywords: Bacillus anthracis, Mycobacterium tuberculosis, Cell lines, Zebrafish, Mice, Guinea pig, Rabbit, Non-human primates, Human subjects. Keywords:Bacillus anthracis, Mycobacterium tuberculosis, Cell lines, Zebrafish, Mice, Guinea pig, Rabbit, Non-human primates, Human subjects. Abstract:Robert Koch utilized animal model systems to put forward his postulates while discovering the etiological agents of anthrax and tuberculosis, Bacillus anthracis and Mycobacterium tuberculosis, respectively. After more than 130 years, we have achieved limited success towards understanding these two pestilences, which have propagated as scourge against humans. B. anthracis and M. tuberculosis are diverse organisms, which share a common evolutionary path in tropics. They adapt unique strategies to overcome unfavorable conditions and surpass the host defense mechanisms. B. anthracis is an endospore forming bacteria that primarily acts by releasing toxins in the host cells.. M. tuberculosis is an intracellular bacteria that resides within the host macrophages by blocking phagosome-lysosome fusion events and ensuring its own survival. The bacterium can remain dormant for long periods, and when activated, it spreads in lungs and other extrapulmonary sites leading to formation of necrotic granulomas. The two diseases are immunologically distinct examples of inducing primarily either humoral or cell mediated immunity. Natural immune response to the two diseases probably explains early success achieved with the anthrax vaccine, while the hunt for successful tuberculosis prevention is still on. For comprehensive understanding of these diseases, model systems are of utmost importance that can alleviate detailed assessment of disease etiology and introductory treatment regimes. 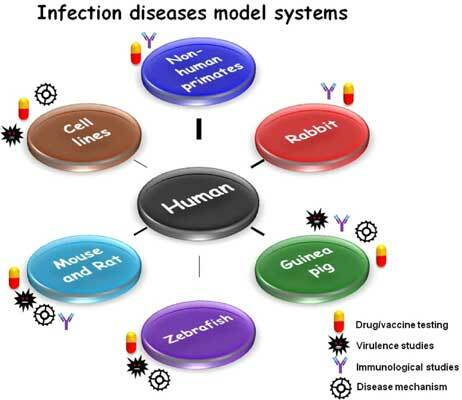 In this review, we discuss the various in vitro and in vivo model systems used to study these two diseases, discussing their contributions and recent themes.